These Hull & Barnsley (H&BR) shunting locomotives were based on Matthew Stirling's earlier J80 (H&BR Class G2) locomotives. The main difference were the wheels which were 6in smaller. The boiler was also lower pitched. 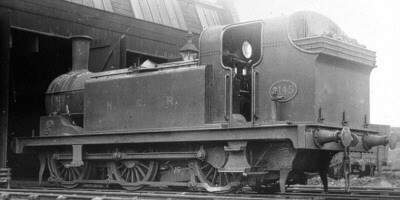 An 0-6-2T version (LNER N12) was built at the same time for transfer and short-trip workings. A total of sixteen J75s were built. The first batch of six was built by the Yorkshire Engine Co in 1901-2. These were followed in 1908 by a batch of ten built by Kitson & Co. The original locomotives were built with domeless boilers. Many of these were becoming worn out when the North Eastern Railway (NER) took over in 1922. The NER initiated a boiler replacement programme, although the first boiler was not transferred until after Grouping (1923). The first rebuild (No. 2497) initially had a Diagram 69 boiler fitted. This was taken from a NER '901' Class 2-4-0. The original boiler design was redesigned as a domed boiler, and given the designation of Diagram 71B. The Diagram 71B boilers were used in all of the later rebuilds, and fitted to No. 2497 in 1936. A total of fourteen of the class had the domed Diagram 71B boilers fitted. The domeless boilers had Ramsbottom safety valves fitted, while the domed Diagram 71B boilers had Ross pop safety valves. Of the two locomotives that were fitted with domeless boilers for their entire lives, No. 2495 eventually had Ross pop valves fitted, but No. 2526 retained its Ramsbottom valves until withdrawal. The first six J75s were initially allocated to the Wath and Braithwell branches. The second batch was mainly used for shunting at Cudworth and Hull. The LNER mainly used the J75s for shunting on former H&BR track in the Hull area. During this period, they were usually seen on short trip work or shunting at Alexandra Dock. During the late 1920s, a few were transferred further afield. Single allocations were seen at Immingham, New England, Boston, and Peterborough during the late 1920s and 1930s. Reduced traffic levels during and after the Depression, hit this class very hard. Fifteen of the J75s were withdrawn between 1937 and 1939. One locomotive (LNER No. 2532) lasted ten years longer. Although it spent much of the late 1930s in store, No. 2532 spent most of the 1940s working at Huskisson Dock. It just survived into British Railway ownership and was withdrawn in 1949. Heating Surface: Total: 1055 sq.ft. None of the J75s survived into preservation. I am not aware of any models of the J75s in any scale. Thank you to Malcolm Peirson for the photographs of HBR No. 113 and NER No. 3145.